Even Marianne Moore disliked it. First of all, thank you for this great discussion on value and viability of poetry that has been going on among us. I hope it continues. I thought today we’d put the discussion into, well a poem. And since I have not yet, and might never write one on this particular topic, and Marianne Moore has already been kind enough to provide one, let’s bring her into it. This is her poem called “Poetry,” which it seems she has edited multiple times over the years. This version from 1924 is generally seen as the best draft. Her 1967 version just cut out everything but the first four lines, which makes it, to my mind, not much of a poem at all, no metaphor, no music . . . just a plain statement. I like it in this form. I do think that her first line is meant to both get at some of us poetry lovers, and to make others feel more comfortable. But I think it’s a literary device. What do you think? Does she really dislike it? And not to sound like your tenth grade English teacher, but what does she dislike? You can click right here to listen to Robert Pinsky read this poem (scroll down the page). I, too, dislike it: there are things that are important beyond all this fiddle. *****it, after all, a place for the genuine. *****************genuine, you are interested in poetry. So glad you posted the long version of the poem. Do you know she was an avid baseball fan? No, I didn’t know that, but that makes a lot of sense. Thanks! I’ve always liked her work, but I’m just now learning more about her. Dorothy Parker wrote a poem called “Oh, Look — I Can Do It Too (Showing That Anyone Can Write Modern Verse),” mocking the likes of her contemporaries Eliot and Pound. But I think this sums up a lot of people’s feelings about modern art in general. For many people, reading modern poetry is like looking at a canvas with paint thrown at it. “I could do that,” they say, or, “My kid could do that,” and, “Is that art?” and it loses all meaning. “It’s just a bunch of paint,” they say, or, “It’s just a bunch of words.” Anytime something looks haphazardly thrown together, people tend to dismiss it without trying to understand it. They would rather listen to Nancy Sinatra than read Marianne Moore. There is truth in that. People, even poets, are often lazy, and we go for what is comfortable, but I don’t want to blame it all on that. If artists lose their audience… I don’t know, I think we have some responsibility to help the reader along, although I am sure many would disagree with that. ..Yes…and a lot of people , post Duchamp , have thrown paint at canvas and told us a pile of bricks on the ground is ‘art’ etc…in a banal way…which does not help the cause. And I do think many write ‘bunches’ of words…which deliver nothing to me but a failed poet….shallow thinker…To me Marianne Moore is a bit like Nancy Sinatra actually…even though I know she was a good friend and inspiration to one of my favourite poets…Elisabeth Bishop…The dimmer light can lead the way for the brighter one maybe…? My general philosophy is that 10% of everything is good. 10% of poetry, 10% of novels, movies, music, etc. The other 90% runs from passable to miserable. Having said that, when there are billions of poems, 10% is still quite a lot. More than anything, I like that this poem shows that poets will always question their place in the world. Defend it, ponder it. 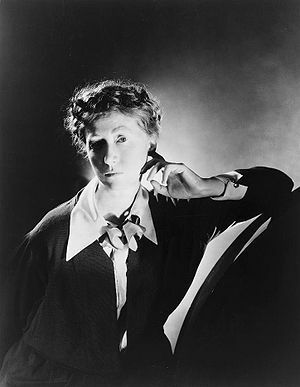 For any poet who sits alone at their writing desk thinking “what am I doing this for?” Marianne Moore has shown us that we are not alone. Perhaps we do it for each other, aside from the fact that we must. Yes…well I typed Elizabeth…but we have a diff spelling correction thing this side of the pond. (sometimes) …..and thus the s…..this does not detract however…from my love of her work…! I like this, and, I like your post about the dislike of poetry. I have struggled with all the things you’ve mentioned, especially the feeling like you’re an idiot if you don’t understand it. I’ve always thought of myself as someone who’s smarter than the average person, yet, most poetry leaves me feeling like I’m dumber than dirt. Life has enough struggles and drama, so why would I want to sit down and relax with something that’s more stressful than relaxing. Who says my poems are poems? My poems are not poems. Then we can speak of poetry!